This is a stunningly beautiful graphic of a young girl holding a yellow rose. She is lovely in that pink dress, surrounded by the gorgeous wreath of blue flowers. 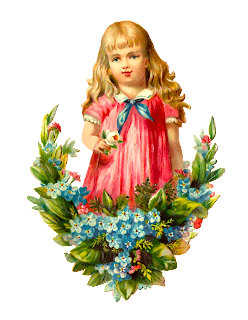 I've recently posted a similar piece of girl clip art here, which has the same design. These two Victorian scraps are from my Victorian scrapbooks. 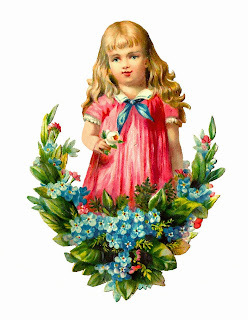 I've given you both the .jpg and .png files of this girl and flower clip art. I hope you enjoy!